That's all she wrote! Looks like this deal is over. Hope you managed to grab one before Amazon apparently ran out. I did not. This one is a huge price drop. 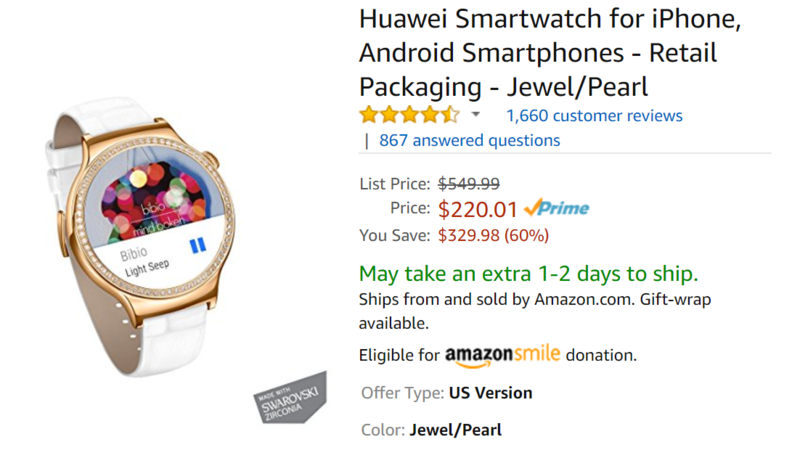 Just a few days ago this was $550 on Amazon (although it has been down around $450 a few times, like back at the beginning of April), but right now Huawei's Jewel/Pearl model of their OG smartwatch is $220. Huawei's Android Wear device is one of the best from the last generation. The style might not be for everyone, but the price certainly is. And the deal is at Amazon with no 3rd party seller or code needed. The only disadvantage is a slight delay in shipping. If you are on the fence, I recommend taking another look at our review of the device. There are newer units out there, but most of the feature sets these days are pretty interchangeable. It might not have one of the fancy new Wear 2100 platforms, but it's still a good little unit and would be near the top of my list if I was to get a new Android Wear device. It even got Android Wear 2.0 a couple days back, so it hasn't been left behind yet. I kind of want this, and I'm seriously considering ordering one, but I am really into ostentation. The over-the-top jeweled appearance and faux alligator band might not be for everyone, but I like to try to make a statement when I can. If you tend towards that direction and have $220 set aside for a smartwatch, it might be time to saunter over to Amazon and pick this up.